Equipped with an uprated Micro 4/3 sensor, the Zenmuse X5S has a dynamic range of 12.8 stops with a much improved signal to noise ratio and colour sensitivity than the X5R. 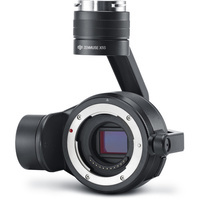 It supports up to eight standard M4/3 lenses (including zoom lenses) with focal lengths ranging from 9mm-45mm (equivalent to 18mm-90mm on a 35mm camera), allowing more creative flexibility. DJI's re-badged Panasonic 15mm f/1.7 Prime Lens is NOT packaged with this X5 version, so you can add your own lenses from Olympus or Panasonic. The new CineCore 2.0 image processing system on the Inspire 2makes the Zenmuse X5S capable of capturing 5.2K 30fps CinemaDNG video and Apple ProRes video as well as 4K 60fps using H.264 and 4K 30fpsusing H.265 (both at 100Mbps). Continuous DNG burst shooting at 20fps with 20.8MP images is also supported. The Zenmuse X5S was designed to keep pace with the rigors of high-end professional aerial imaging. The onboard Micro 4/3 sensor has been upgraded, significantly improving image quality. With a pixel size of 3.4μm, this 20.8-megapixel sensor captures more detail than the previous sensor. It has 12.8 stops of dynamic range as well as a better signal to noise ratio and colour sensitivity than the X5R, allowing it to create clear, low noise images in low light environments. 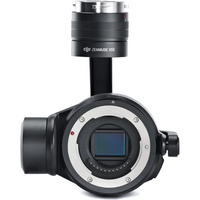 The Zenmuse X5S now supports up to eight professional lenses (available at Camzilla) with focal lengths ranging from 9mm-45mm (equivalent to 18mm-90mm on a 35mm camera), providing more creative control over the final look of a shot. The DJI CINESSD card (PCIe3.0 NVMe SSD support) and a highly optimized FAT32/exFAT file system, allows Zenmuse X5Sfootage to be transferred directly through the DJI CINESSD STATION card reader to a computer at high speeds without any additional software. Footage also supports the DIT standard. CinemaDNG or Apple ProRes workflows can be used for post-processing. Stabilizing the Zenmuse X5S is a highly optimized 3-axis gimbal with pinpoint-precise motor rotation with a control accuracy of ±0.01° powered by a dedicated processor. Rather than rely on electrical slip rings — as is common with many gimbals — the Zenmuse X5S uses a unique mechanically limited design and concealed wires to ensure more stable data transmission and greater durability. Vibration is eliminated using three damping balls and a lightweight damping board, creating seamlessly smooth video.360° rotation remains possible through gimbal rotation and smooth aircraft yaw. Stable, smooth footage1 can be captured even when using a 90mm2 lens. Take control over every camera setting from afar, including focus, aperture, and format, directly in the DJI GO 4 app. Precision control also extends to focus, with DJI GO 4 and the optional DJI Focus, offering focus control across the entire transmission range. Using DJI Focus, no additional cables or motors are needed and new Lightbridge technology sends all signals as far as 4km away.